DALLAS -- Marco Scandella's celebration was cut short by the sight of referee Kelly Sutherland waving both arms out to signal a no goal. Sutherland, and the official review that followed, ruled Dallas Stars goalie Ben Bishop was interfered with by Buffalo Sabres defenseman Nathan Beaulieu, negating what would have been the tying goal with 15:32 left in the third period Tuesday night in American Airlines Center. That was as close as the Sabres would get to their first winning streak in six weeks, as they lost to the Stars, 1-0, on the second night of a back-to-back. Buffalo, now 25-19-6, fell to three points back of Columbus for the second wild-card playoff spot and failed to win back-to-back games for the first time since Dec. 11-13. 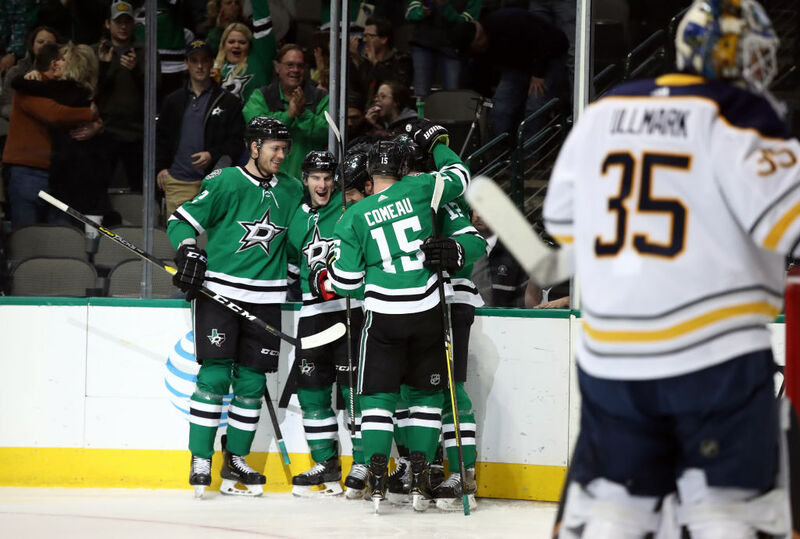 The Stars (25-21-4) scored 8:39 into the first period when Jamie Benn capitalized on a turnover at the Sabres' defensive blue line. Linus Ullmark, making his fourth start in five games, made 26 saves. Opening salvo: The Stars took a 1-0 lead when Sabres defenseman Zach Bogosian's backhanded pass through the middle of the defensive zone was intercepted by Taylor Fedun at the blue line. Fedun then passed to Benn, who beat Ullmark five-hole. Slow start: That would be an understatement. Sure, the Sabres outshot the Stars, 10-9, in the first period, but Buffalo was lucky to be trailing by only one goal. Ullmark stopped Mattias Janmark's breakaway less than two minutes into the game, and Tyler Seguin hit the post after Rasmus Ristolainen's turnover. Perimeter shooting: Scandella accounted for five of the Sabres' shots on goal in the first period. Their forwards combined for only three. The team's first line missed the net on five of its six shot attempts. Power(less) play: The Sabres had one shot on goal during a first-period power play and twice iced the puck. They are 1-for-25 on the power play over the past 10 games. Sloppy second period: Buffalo did not appear as disjointed in the second period. It began to match the Stars' physical play and defensemen stopped being passive. That did not translate to much offense. The Sabres struggled to maintain possession in the offensive zone. Their best scoring opportuniity came when Nathan Beaulieu surprised Dallas goalie Ben Bishop with a high shot from the right-wing boards, but the puck was knocked down and cleared. Lone star slump: The Sabres were 0-6 in their previous six road games against the Stars and were outscored 23-9 in those games. They had not won in Dallas since Jan. 15, 2009. Lineup: Winger Jason Pominville and defensemen Matt Hunwick were healthy scratches. Remi Elie and Nathan Beaulieu replaced them in the lineup, respectively. Defenseman Lawrence Pilut was also a healthy scratch for a second consecutive game, and Casey Nelson did not make the trip as he is still on injured reserve. Tyler Pitlick, Martin Hanzal, Stephen Johns and Marc Methont were out of the Stars' lineup because of injury. Next: The Sabres will await word if they can fly back to Buffalo late Wednesday night and are currently scheduled to practice Thursday in KeyBank Center.